SOLOLÁ, Guatemala, December 9 – I am now at the beginning of my fourth month here in Guatemala. My Spanish has improved dramatically, which has allowed me to move around much more freely. Language is quite a powerful tool. Finally, after much organizing, consternation, etc. 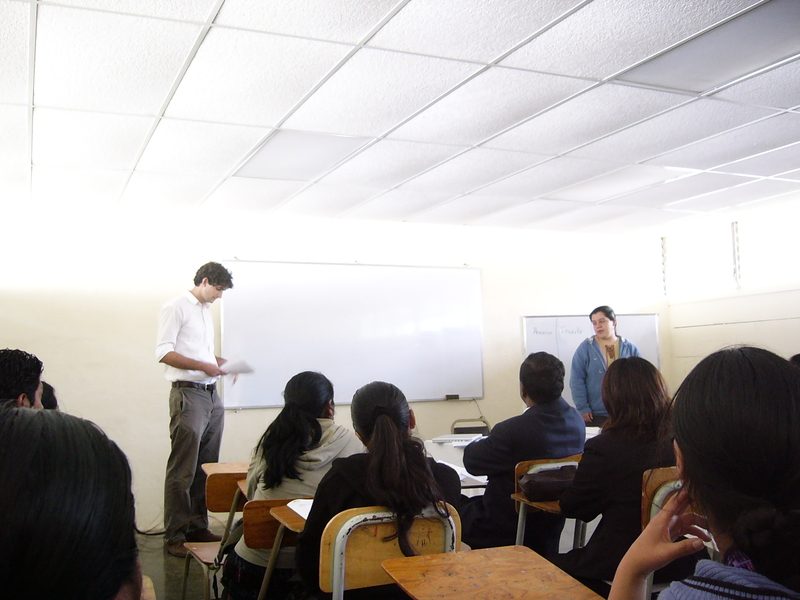 (I have been wielding the phrase that you have used, don’t let the perfect be the enemy of the good, like an ax) we have executed the first (saving, spending and investing) of a series of basic business education courses here at la Universidad de Valle Altiplano in Sololá. Nearly 40 people showed up and paid 10Q ($1.50) to attend the course. 34 of the 39 people were women; all owned businesses, and over half were teachers who said they were planning on bringing the lessons to their classes and homes. It really was a joy and fortunately there was a lot of interest in the rest of the lessons that the Barefoot MBA has to offer. My biggest fear going into the day was that the lessons were going to be too easy. While I think that the lessons could have been a little harder (the next subjects are inherently more difficult), fielding a question about how saving money in a bank is useless because you can’t earn any interest reassured me that there was a need for this kind of education. After going over what the result of saving 50Q every two weeks for 10 years would be and how much interest you would earn from your savings (people were certainly shocked to see the results of this exercise) there was agreement that it was a good idea. The activities that we designed worked great (we broke into groups and proposed different scenarios and brainstormed how one should deal with them). Group participation, it seems to me, is very helpful. Going forward, in addition to offering additional lessons on Saturdays, we are going to continue working with the Grameen Bank (the 10 or so other micro-finance organizations I met with are moving much more slowly. Processes with them are pending) in order to get a group of their clients to come to the university a few times to receive all of the lessons. We plan on using this group to help determine the effect this type of education has, if any. Hopefully we will be able to gather some anecdotal evidence that shows that the course is having a positive effect. Any advice on how to go about this would be great. Ottavio, who finished his undergraduate work at Stanford in June, contacted us before heading to Guatemala for six months to work with the UVG and continue the translation and adaptation Scott started in March. UVG plans to partner with Grameen Bank for two sessions on saving and investing, one in November preceding an information session on microlending and one in December for a smaller group of Grameen Bank clients. As the world ushers out the end of the worst economic year in recent memory, we’re more encouraged than ever about the future of the Barefoot MBA. Through partnerships with organizations with existing infrastructure and communities, the curriculum is reaching those who need it and continues to spread even without our hands-on support. We hope those who learn from the Barefoot MBA now internalize the lessons and pass them along to their own families and communities, virally enabling better business decisions — and in turn better lives. As I leave Guatemala City early in the morning, I can’t help but think how much we accomplished in so little time. Truly, much of the credit goes to everyone at the University – they were the orchestra and I merely the conductor, perhaps even just the off-stage composer, in this symphony. The adaptation guide, I was told, was very helpful in determining what kinds of examples to include. Still, I learned quite a bit from the questions I was asked, and am making the appropriate updates. Our hope with the adaptation guide is that it will fully replace the need for my physical presence to complete an adaptation. In fact, seeing how quickly the group worked on Wednesday, we’re nearly there. While I love seeing parts of the world often not accessible, or desirable, to most tourists, I cannot physically be in two places at once (a rate-limiting factor to the eventual spread of the curriculum). This is not to say our work is done, or that it will slow. My to-do list is still long, both for this trip and for the project as a whole. We have yet to put the finishing touches on the final documents before we post them (hopefully in the next few weeks). We need to refine what is now only an outline of metrics we hope to use to measure how the Barefoot MBA curriculum affects businesses, their success, and the decisions made by their owners. And finally the staff at UVG will need to implement the training programs. I have full confidence that they will continue to dedicate the resources necessary, to the best of their ability, to put the Barefoot MBA into action. And should they have questions, I am only an email away. And so it is that I leave Guatemala, appreciative of the generosity of my hosts at the University, amazed at how much we have accomplished in such little time, and hopeful for the success of the curriculum, and thus the participants who will live more successful lives. I’m up early this morning to spend the entire day visiting more businesses at some of the small towns around the lake. Though the morning light is beautiful, and our trip by boat across the lake refreshingly crisp, I’m tired from staying up reading last night. My first visit is to San Juan La Laguna to visit Lema, an association of women who make dyes from natural sources and weave the fabric into about 33 different products. Rosalinda is explaining to me about the details of her business, the number of women who are part of the cooperative (15 work intensively, another 65 make partial contributions, and nearly all are illiterate), the range of prices for their goods (5 quetzales (USD$0.68) for a small woven hackeysack to 550 quetzales (USD$75) for a duvet), and their general margins (about 30% for direct sales, a bit less for items sold through intermediaries at markets farther from Solola). After six years of business, nearly all of which have seen year-over-year growth, Rosalinda’s comment about success is: we must always innovate (“tenemos que innovar siempre”). My next stop is back on the eastern side of the lake at the workshop of Matea in San Antonio Palopo. Matea has been in business for 20 years, dying fibers from leaves and then spinning them into thread. She sells some of the thread to markets as far away as Mexico, and uses most of the rest to weave into fabric. Like Rosalinda in San Juan La Laguna, she makes a variety of products. However, as is somewhat typical around the lake, the designs and colors vary quite significantly from town to town all around the lake. In San Juan, the patterns were more simple and colors more subdued; here in San Antonio Palopo the colors are more vibrant and designs a bit more intricate. Matea takes me through her workshop and shows me the different stages of making a finished product and the machines she has bought (from her father, who is a carpenter) to be able to produce the goods faster (making a scarf on a foot-powered loom takes only 1 day, whereas it takes about 4 days of work to make the same one by hand). She comments that much of this is typically a man’s work, but that she is able to do it equally well. Matea is very proud of the fact that, though she had to leave school, she is able to earn money to send her children to school. She is a bit upset that it has become more difficult to profit from her goods in the local markets as more people have entered the textile business and more people now know the costs of production. This has forced her to look for markets farther away and to deal with intermediaries, who also cut into her profits. She would like more money to invest in thread, but says that the requirements necessary to take out a loan are too much of a burden and would require her to spend her time doing something other than producing or selling goods – time that she does not have. I spend the rest of the day visiting other businesses including Magdalena in Santa Catarina Palopo who also sells textiles and Carmela in San Andres Semetaba who grows organic mushrooms. On my way I pass many fields, some in cultivation, such as this onion field, and others lying fallow. The opportunities here are immense, but many of these people have been caught off-guard by the fast pace of today’s world market. A generation ago, markets changed slowly, patterns were subtle, emerged slowly, and allowed people sufficient time to adapt. Today, markets are flooded with new products daily – yesterday’s hand-made ceramic masks are replaced by inexpensive wooden snakes from China. The success of the first friend-chicken stand at the market invites 5 others the following week, no longer one more the following year. Selling at the market was a skill passed from generation to generation, the same way Maria learned to sell tortillas from her mother and now sells mangoes. However, prior generations have not passed along the skills to know what to do when competition arrives not with a whisper, but with a deafening crash. It is my hope, our hope, that the Barefoot MBA will infuse into the generational market knowledge a few ideas about how to adapt to the rapid changing of the markets. In Thailand, Katherine and I had to spend a significant amount of time thinking of local examples to fit each of the lessons and then finding local businesses that were similar. While I expected to need to do a significant amount of research first, and then adapt the examples, and then translate the document, I’m quite surprised to return from my day to find two documents adapted and translated. The group of students and staff have done an amazing job of translating the documents and, with their knowledge of local business from the work they already do with these entrepreneurs, have also created two adaptations: one for tourist businesses (e.g., textiles and leather goods) and one for agricultural businesses. I’ve been up late into the morning reading both documents and making some small changes to ensure consistency across all 4 adaptations we now have, but my excitement at the progress made today has kept me energized. It seems that tomorrows visits to small towns around the lake will be more for my own education than for purposes of adaptation. Instead of visiting and then adapting, I will be visiting some of the businesses already included as examples in the adaptations. My thanks to Maria Marta, Victor, and all the people at Universidad del Valle de Guatemala Altiplano who helped with this today. Again, amazing work. In fields around the campus, a group of women have come together to grow amaranth. As I am learning, amaranth has some incredible properties: each plant will produce 40,000 to 60,000 seeds seasonally, which are 13 to 15 percent protein (among the highest for any grain) and are high in fiber, calcium, iron, potassium, phosphorus, zinc, and vitamins A and C; its leaves are also edible, containing more calcium, phosphorus, and vitamin C than spinach; and it is resistant to the heat and drought, requiring much less water than corn and beans. Amaranth is native to Mesoamerica and has been cultivated here for approximately 7,000 years. Though it was nearly eradicated with the Spanish Conquest, it is being replanted in parts of Mexico and Central America. Today I am visiting Victoria, who manages and operates an association of women who are making products from the amaranth plants. They sell a powder of amaranth seeds which is used to make a local drink or mixed with corn to make tortillas, and they make a natural, herbal shampoo. It takes three days to mix and settle the ingredients including the amaranth leaves, which they purchase for one quetzal (USD$0.14) each, into a liquid ready to be bottled as shampoo. Victoria and Florinda showed me the final product, and took the time to pour a bit of it into 8 ounce bottles, which they will label and sell for 12 quetzales (USD$1.63) each. They sell about 40 of these bottles per month, earning roughly USD$65 from selling shampoo. In addition to their other products, they are able to make a living for themselves and provide me with an example of how the support they receive in the form of business advice from organizations like UVG-Altiplano, plus a few small loans, means the difference between subsistence farming and a less stressful, more fruitful quality of life. The most interesting part of the adaptation process, both for me and for the staff at UVG Altiplano, is learning about the details of the local businesses in the markets. Discovering the costs of the goods, the history of the business, the competitive factors that exist in the market and trying to capture these to change the examples in each of the lessons. We are simultaneously translating the curriculum and plan to produce two versions in Spanish – one for tourist businesses and one for agricultural businesses. (I hope to use my time on the airplane back to the US to translate these back into English for those interested). In addition, we are building a tool to measure the outcome of the use of the Barefoot MBA. The staff at UVG-Altiplano has already done quite a lot of work with many of the small businesspeople in the markets, most of whom are women, to understand their lives, how they survive from their businesses, and where it may be possible to make small improvements. We are creating a tool to try to measure their businesses, what they sell, how many, and at what profit, to understand how their businesses function before the Barefoot MBA curriculum, so that we can measure similar aspects in the weeks and months following the Barefoot MBA. This will, we hope, finally provide a way to measure the outcome. We heard from the participants in Thailand that they appreciated the lessons and wanted more. However, we do not know if the participants remembered the lessons, if they were able to make the changes they discussed, or if their businesses were more successful (as we hope). Our hope is that this tool will provide a more objective measurement of the outcome. At 1,500 meters, Lake Atitlan lies in the highlands of Guatemala, surrounded by now-extinct volcanoes. The small villages surrounding the lake have distinct products in their markets and different colors of traditional dress (actually patterns and colors imposed by the Spanish as uniforms to help identify the different indigenous tribes and languages). Sololá is located on the northern edge of the lake. 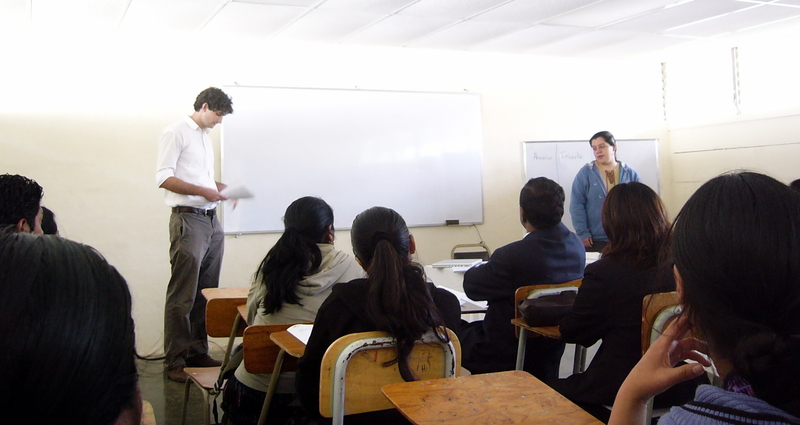 The Altiplano (highland) campus of UVG has been working closely with the people here in Sololá. There is a new business incubation program for the high school and college students and their work extends to the local people, the majority of whom are Kaqchikel Mayas farmers and craftspeople who struggle to make a living selling their goods in the local markets, both through improvements in sustainable and organic agricultural practices, and now hopefully through improved business practices as well. The market in Sololá, unlike that in rural Thailand, serves two distinct groups of customers: tourists and other locals. As one vendor becomes successful selling a particular good, others copy it. Thus, there are 7 carts selling roasted chicken and potatoes, all next to each other. They compete on price, and talking to them (though not having tasted 8 pieces of chicken), it is difficult to discern a difference in the quality of their products or other aspects of their businesses. The price competition reduces their profits, and they now struggle to afford life’s necessities. Maria is in a similar situation. Maria sells mangos and has been selling mangos in this market for 26 years. She learned to sell from her mother, who sold tortillas in a village on the southern coast of the lake. 22 years ago a space in this market opened, and she began to sell mangos here. She sells 300 to 400 on a good day, at 1 quetzal (USD$0.14) each. She makes enough to on a good day to get by, but never enough to save. Over the years she has seen more and more people come to this market to sell mangos, and she has noticed that she is able to sell fewer mangos. Taking the Barefoot MBA to as many places as we can has led me to cross paths with many things I might not have discovered without it. Certainly I have seen places and met people I might not have been able to access – rural parts of Thailand this past summer and rural parts of Guatemala in the days to come, incredible people in far corners of the world, and our own backyards, doing incredible things to help others. I have also had the pleasure of meeting organizations pursuing similar goals of education, community and economic development, and poverty alleviation, our host being one such example. I am in Guatemala at the invitation of the department of engineering at the Universidad del Valle de Guatemala (UVG), and specifically one professor who has been working to add entrepreneurial aspects to the curriculum. Not only are they trying to provide a more well-rounded education for their graduates, they also have a campus on a former army base in Sololá that works closely with the people of the region doing work in job creation, economic development, and sustainable agricultural practices. I have read their studies of the types of businesses owned and run by the rural women in and around Sololá, and have a sense for the numbers describing the income levels there. I have been told, and will see firsthand tomorrow afternoon, how these women struggle to provide for themselves and their families, many having lost their husbands during the 36 years of civil war that ended in 1996. Often times poverty is better understood when seen in person, and I hope to not only begin to understand it, but also how the Barefoot MBA can help. While the document has not yet been translated into Spanish, we have, and will, conduct all our work in Spanish (or local dialects through Spanish translation). After all, the goal here is to help the faculty at Sololá understand how to use the curriculum so that they may continue to follow the adaptation guide after I have left and can continue the work in my absence. Hasta mañana. Two professors working in rural development invited us to travel to Guatemala to adapt the curriculum to help entrepreneurs there. This marks the second country, and second continent, for adaptation of the Barefoot MBA. In addition to adapting and translating the curriculum, Scott will test the Adaptation Guide to make sure it covers all salient details. Check the blog for updates as Scott gets to know the local markets and works with his hosts to adapt the Barefoot MBA.